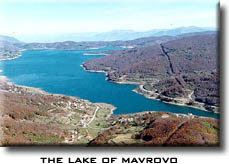 The Mavrovo lake is settled in the Mavrovo valley, between the Bistra, Šar and Vlainica mountain. It lies of an attitude of 1,233 meters above the sea level and has length of 10 km and width of 3 km. The lake covers an area of 13,7 sq km of the Mavrovo national park and it's deepest point is at the flood-gate, 48 meters. The lake was built to use the waters of the Radika and Mavrovo river, in order of production of electrical power. The lake filled the field of Mavrovo with water. 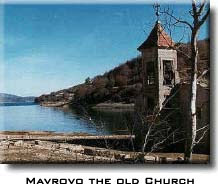 Today there are four villages on the shores: Mavrovo, Mavrovi Anovi, Nikiforovo and Leunovo. A power plants were built in the Raven, Vrben village in 1959, north of the lake on the river Radika river and another one in Vrutok, built in 1957. This power plant produces by year, 390 millions kWh. The area of the lake as a national park is also place of tourism. During the summer period because of the lake and in winter period the ski center "Zare Lazarevski" works.